The Gilson Safe Aspiration Station is a great solution for safe and contamination free liquid handling. This standalone aspiration station is a closed system, with adjustable speed and attachments allowing you to use the instrument from ELISA tests to cell cultures safely and efficiently. All components of this aspiration station are autoclavable, including the unbreakable bottle, and it also features an inline hydrophobic filter to trap aerosols. 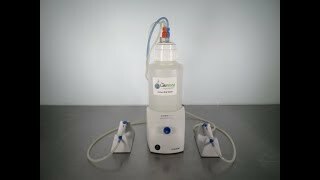 The Gilson Safe Aspiration Station is easy to use with the push of a button and with its quiet vacuum, keeping it nearby won’t be a distraction. The compact nature of this liquid handling station means it won’t take up too much space on your workbench or in your fume hood. This Gilson Safe Aspiration Station has been fully inspected and aspirated without issue. All of our lab equipment comes backed with our standard warranty. Should you have any questions, please don't hesitate to contact us.